This seems to be a growing issue with Android phones, affecting users on versions 4.3 and 4.4 (Jellybean and KitKat). It’s particularly annoying because the camera is one of the key features for smartphones (e.g. selfies, food pictures, QR code scanning). 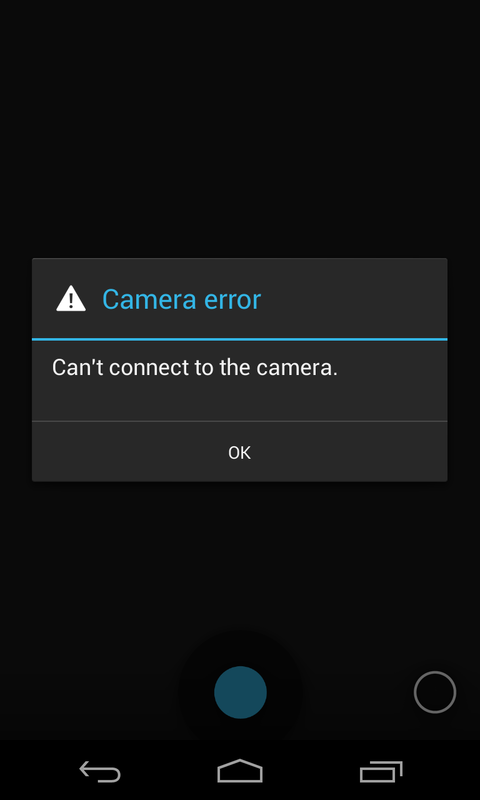 Imagine an important event is unfolding before your eyes, you whip out your phone, open the Camera app only to get a “Can’t connect to the camera.” error. And a reboot is the only thing that will fix it. But by the time your phone finishes booting up, the event is over. This post goes through several workarounds/fixes. I will list the fixes/workarounds in terms of difficulty, from least to most time consuming. I have personally tried #1-8 in the below list at least twice in my quest to solve my issue, only discovering it was a specific app through a process of elimination. My particular issue was caused by #3. You can also try clearing your recent apps list (hold down menu, and tap on the “clear all” icon). If your phone has an expandable memory slot and you are storing photos on a MicroSD card, the card may have some corrupted sectors, leading to corrupted photos that the Gallery app automatically tries to load. Try taking your MicroSD card out, reboot your phone, and see if this fixes your issue. If it does, you may need to insert a new MicroSD card. This problem could be caused by apps that use the camera, and poorly “close” the camera when not in use. Snapchat, Skype are widely reported apps that some users have had camera issues with. Other possible culprits may be QR code scanning apps, Google Goggles, and basically any app that has a camera feature. In my case, my camera issues were being caused by Cerberus, an excellent anti-theft app with awesome features. The one feature that was causing my camera to die was the “Wrong Unlock Code Auto Photo Capture” setting. What this setting does is it takes a photo (using the front camera) when the number of failed unlock attempts is reached, and emails it to me along with the general location of the phone (GPS coordinates, a nearby wifi access point, and a rough street address). I have changed my failed attempts threshold from 1 (default), to 3. I chose not to completely disable this setting because I still want to get a nice picture and location of any potential future thief who decides it’s smart to steal my phone. I’ll just need to make sure to be more precise when entering my unlock code. Side-note: I have integrated Cerberus into my actual ROM, meaning that it will even survive a wipe/factory reset. How I was able to reproduce my particular issue was: rebooting my phone, correctly entering my unlock code, testing the camera to see if it was working, then locking my phone and entering multiple incorrect codes at once which would cause my camera to lock up and die. Shut down your phone, then open the back and take out the battery. Wait a few seconds, then put the battery back in and boot up your phone. This step may not do anything, but it does allow your phone to rest and boot cleanly. A person named Temasek has created an app that runs the kill -9 `pidof mediaserver` command, which will restart the mediaserver process on your phone. It didn’t work for me, but it appears to have helped others. It’s moreso a workaround than a fix. If your camera fails, just tap the Camera Restart app, wait 2 seconds, then try opening your camera again. There is also the Atrix Camera Fix which most likely does the same thing. Note: your phone must be rooted for the above two apps. You will need to be on stock for this. This requires you to copy the correct firmware for your phone model onto your phone, then dialing a specific number to open the system menu and flashing the firmware. Relating to points 1 and 2, the camera may be failing because there may be some corrupt photo/video files on your phone. Warning: this will delete all of your data. I consider this step a last resort. Before doing so, you may wish to use Titanium Backup (root required) to backup your user apps, and another app to backup your SMS message/etc. If you are on an AOSP-based ROM and are experiencing camera issues, you may want to flash back to stock, or use a stock-based rom (e.g. Dandroid for the S3). In terms of flashing back to stock, I have an S3 and I have used firmwares posted in this thread on XDA-Developers. NOTE: be sure to flash the correct ROM/firmware based on your phone model and firmware version. I am not responsible if you brick your phone. At this stage, if all 8 of the above steps don’t work, the last step would be to either get someone to look at your phone and do a possible hardware camera swap, or replace your phone.